Felecia was a young mother in her mid thirties. No-one knows the real cause of her death. Suddenly she fell ill. They took her to the hospital. Nothing seemed to help. Last week she died leaving 4 children behind. Andrew Wallace is one of our Nursing Students at the Tubman University in Maryland. Felecia, who died was his sister. 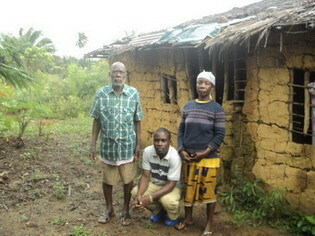 The Grandpa & Grandma could keep these children if they had some help with food and school fees. Andrew is there to supervise and oversee the family. 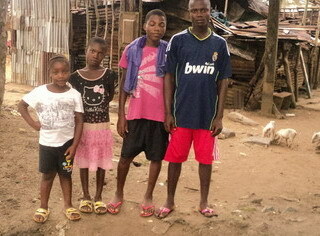 Mary is 6, Masoline is 9, Peter is 11 and Emmanuel is 15. Just before Christmas this same Grandma lost another daughter. She too had 4 children. Grandma suddenly has 4 children to care for at Christmas. Susannah, Mahlon, Naomi and Ruth. Now suddenly there are 4 more children without a mother or father. Provision of Hope has been sending money for food and paying $25 per month for their rent. Susannah and Mahlon are attending school. Susannah is 15 and in Gr. 6. Mahlon is 9 and in K-2 class. Susannah has been a great help to Grandma. The twins, Naomi and Ruth are only 2 yrs. old. Any contribution towards this home would be most appreciated. 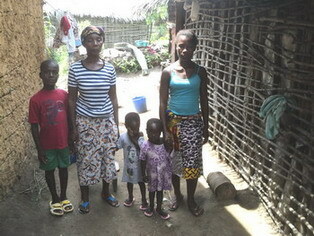 Mary, Masoline, Peter and Emmanuel all need funding to be able to attend school. Karen…could you please email a little more about this family, what is the greatest need, etc.! Thank you. Right now their greatest need is food and shelter. Andrew Wallace informed me that there is another room we could rent in the same place as the Grandpa and Grandma live, but it would cost us 25.00 per month. I hope the landlord will give it to us for 20.00. They will need mattresses, sheets and mosquito nets. Hopefully we can put them all to school this coming September. I’m sure tonight, the family would say their greatest need is to be able to properly bury their mother. Not every one in Africa can afford a proper burial. Thank you Deanne for your faithful monthly support. We continue to help many who are as desperate as these, all because of people like you who care to help. I am deeply saddened by these events. So many die so young in Liberia, it is all too sad. The good news is, we have someone donating $50 for food, and $20 to rent them a room, in the same house as the Grandpa and Grandma, with the previous 4 orphans. It would be great if we could find a cook, to help Grandma. The one daughter who died, took care of Grandma, now she is left to care for all 8 of the children. 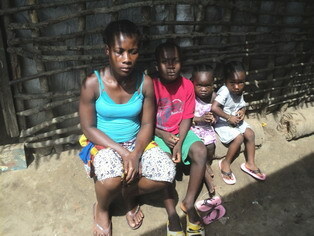 What happens in these situations, all over Liberia, is that you have the older children taking care of the younger ones. We will do what we can to give these children ALL they need, and the proper care they need too. God will make a way!